Texas is a unique place. When we came into the union in 1845, one of the issues was that we would be able to leave if we decided to do that. My hope is that America and Washington in particular pays attention. We’ve got a great union. There’s absolutely no reason to dissolve it. But if Washington continues to thumb their nose at the American people, you know, who knows what might come out of that. 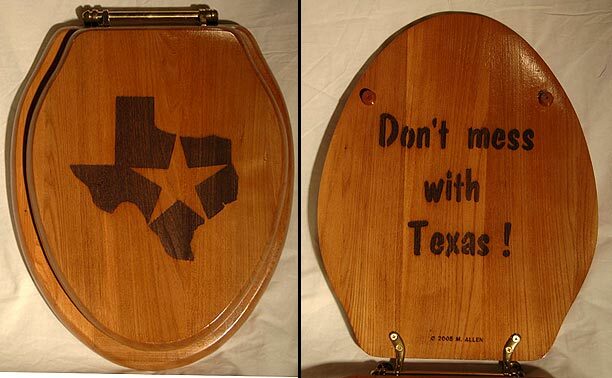 But Texas is a very unique place, and we’re a pretty independent lot to boot. Well, way to drop the ball, Perry. By all means, secede–I’m sure nothing bad would come of that. We’ll start building a ten-foot-high border fence around Texas immediately, while you appoint Chuck Norris President of your new taxless Neocon utopia. But before you do that, we’ll make sure to close down all the interstates and federally-maintained buildings and programs (including any missile silos, thank you very much) in your newly-sovereign territory, and we’ll make sure all flights into Ronald Reagan have to go through customs first. And while the conservatives decide in droves to “go Galt” and leave the U.S. for the Republic of Texas, we’ll rest easy knowing that, even if they stayed, the Republicans could never win another presidential election without your 34 electoral votes. But I think we’ll keep Austin, if you don’t mind. Now, Perry’s right: Texas is a unique place. Specifically, it’s unique in that it was the test case for the Supreme Court ruling which said that states do not have the right to secede. What Perry’s citing here is an urban myth, apparently borne out of ignorance or misunderstanding of the 1845 Joint Resoultion for Annexing Texas to the United States. Texas most emphatically does not have the right to secede from the union (nor does any other state), and while it has the ability to split into five states, it cannot do so without the consent of Congress. The mocking morning commentary about Perry’s silver tongue (and the teabagging event in general) seemed to leave a bad taste in some people’s mouths. A pair of callers in particular had me itching to pick up the phone and slap them around a bit. The first said that several states had bills or proposals to “exercise their Tenth Amendment rights” or take back said rights, by seceding or threatening secession. Now, this is a profoundly stupid argument: how do you justify leaving the union by claiming rights granted by the union? The rights granted by the United States Constitution are granted to the United States, and not to any other sovereign countries. It’s kind of a Catch-22, I guess: even if states were granted the right to leave the Union by the Tenth Amendment, they’d be forfeiting that right as soon as they left, which means the federal government wouldn’t have to honor the right–or any others. Assuming that secession would be interpreted as an act of war, how long do you think it would take for the feds to recapture Texas? Now, I could see where you could interpret the intentional openness of that statement to include “the power to secede,” and furthermore, to assume that that power would be reserved for the states and not the people. The problem with Rick Perry making that interpretation, however, is that the branch of U.S. Government tasked with interpreting the Constitution is not “state governors,” but The U.S. Supreme Court, which has already helpfully interpreted the Constitution’s stance on the matter. Right or wrong, the precedent set by Constitutional law, in particular Texas v. White, explains that secession is not among the powers reserved to the states by the Constitution. The states can propose bills all they like to “reclaim” this nonexistent Tenth Amendment right, but they’re not going to get it without a lawsuit. The second caller said he was happy that Perry was making these (stupid) remarks, because it draws more national attention to Texas, and Texas is doing a lot of good things with respect to job creation and whatnot. Even assuming that his claims are true (and I see no reason really to doubt them), shouldn’t that be what he wants them to get attention for, and not the idiot comments of their seditious governor? It seems to me that these comments are just going to draw more national attention to the screwups of the young-earth creationists on the Texas State Board of Education, and the legislation to allow the Institute for Creation Research (and any other educational organization) to print out worthless diplomas, and so forth. The best way to draw attention to the good things your state’s doing is to stop electing morons who overshadow those good things with ridiculous stupidity.